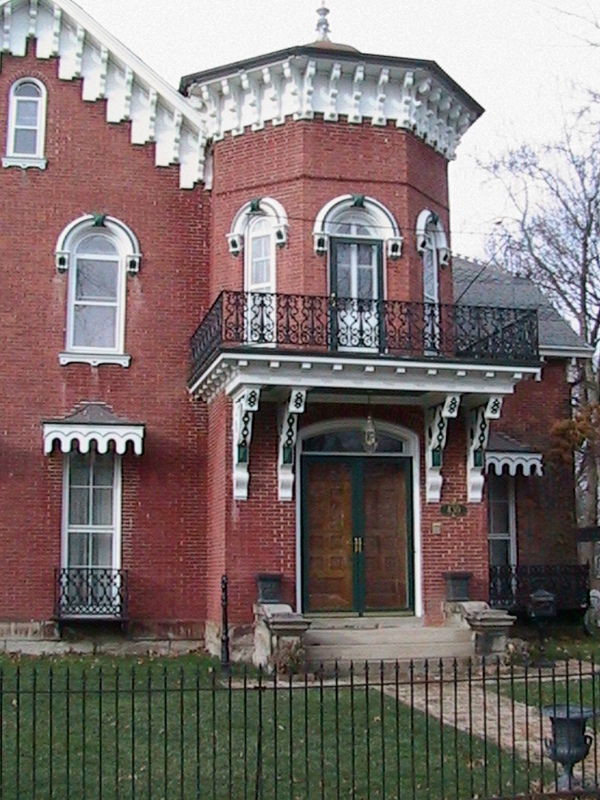 Towering above many Italianate, Octagon and Queen Anne homes are campaniles and cupolas. Campanile is a term used in Italian to describe a church bell tower and it typically rises up from the ground level. A cupola is a tower that rises from the roof level and is sometimes referred to as a belvedere (literally meaning a good view). 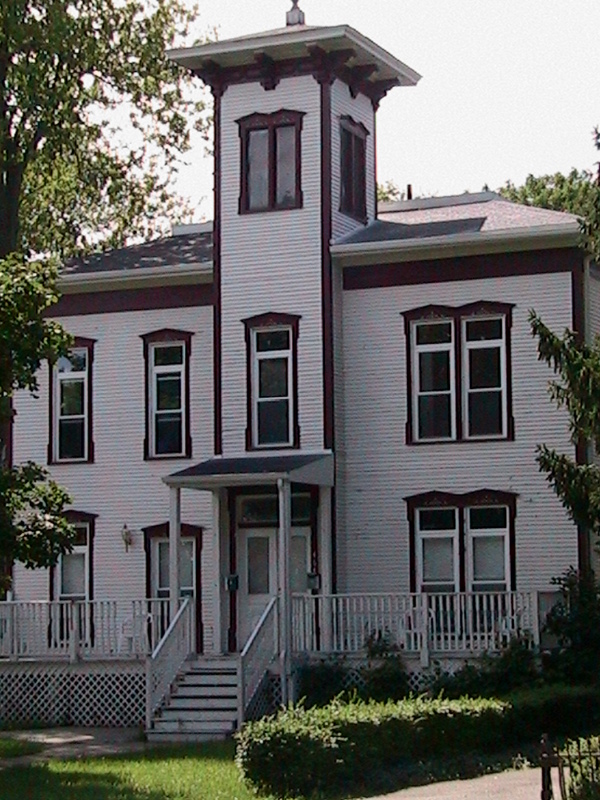 Cupolas are typically placed above a central staircase to afford light and ventilation to the center of the house. 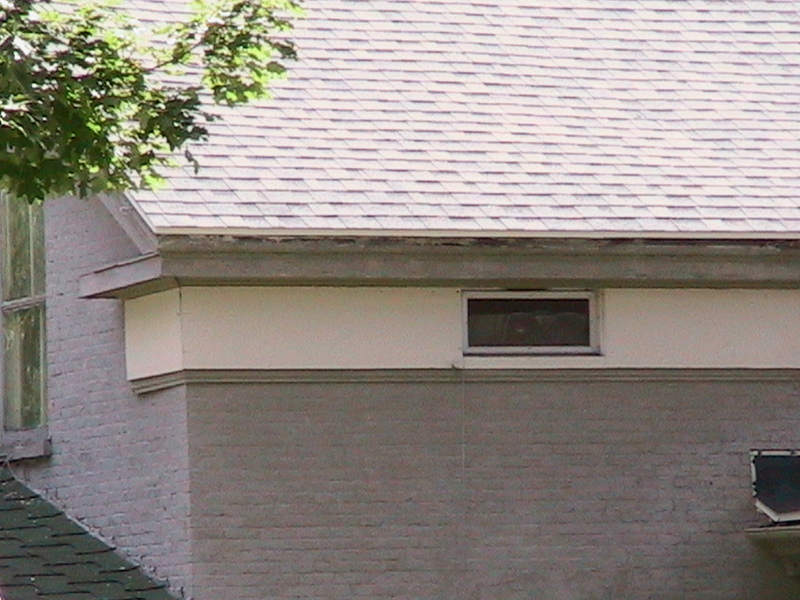 Dormer is the name of a window set vertically into a sloping roof. Its name derives from the French word meaning “to sleep” because these windows sometimes provided light and air to attic-level bedrooms. 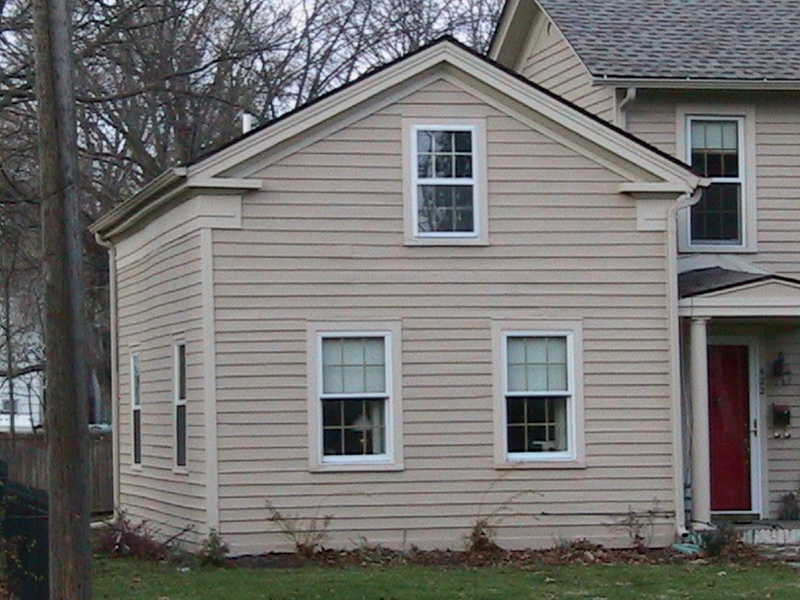 Dormers come in a variety of styles as illustrated here. Gable or pediment roofs create a triangular area on the short side of a rectangular structure. 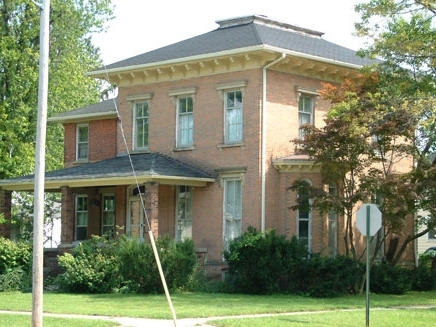 Greek Revival homes often have low-pitch front gables that resemble Greek or Roman temples. Sometimes these front gables or pediments are "broken" because they are open at the bottom to allow room for upper-level windows. 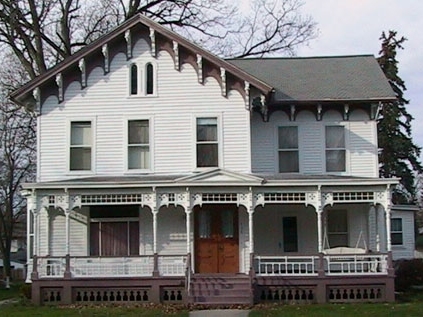 The Georgian Colonial Revival style typically has side gables that appear on the side father than the front of the home. 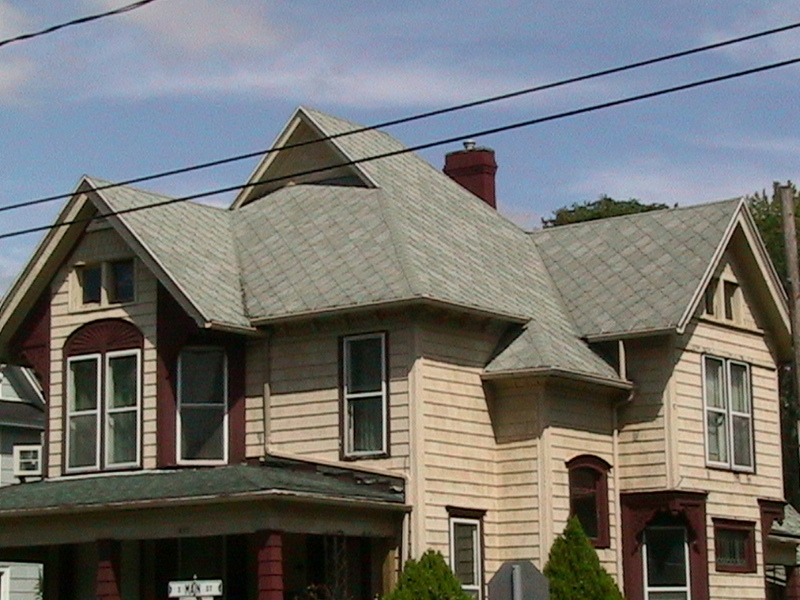 Houses with cross gables have two or more gable roof lines that intersect at right angles. Hipped roofs have four uniformly pitched sides. On a square home a hipped roof will resemble a pyramid. Mansard roofs are the key feature of Second-Empire style buildings. They are hipped roofs, nearly flat on top and steeply sloped on the sides, generally covering the entire height of the top story to a building. The steeply sloping sides can be straight, concave or convex. This type of room is named after the seventeenth-century French architect Francois Mansart, who first popularized the form. 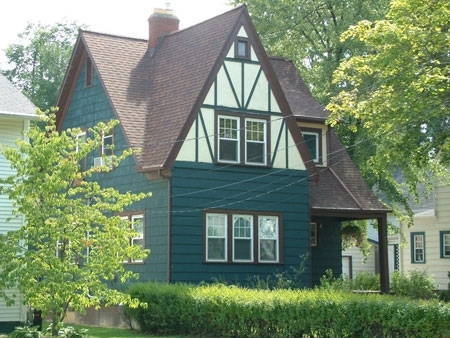 Queen Anne-style roofs are complex and have either cross gables or combine hips and gables. The complexity of the roof reflects the complexity of the floor plan below. 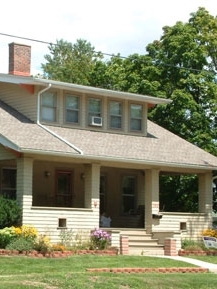 Gambrel roofs are the distinctive feature of Dutch Revival buildings. They were originally found on 17th-century Dutch and English colonial homes. Now associated with barn roofs, these roofs have two separate raking slopes that create a profile that resembles the section of a bell. Eaves are the lower edge of the roof that projects beyond the wall underneath. 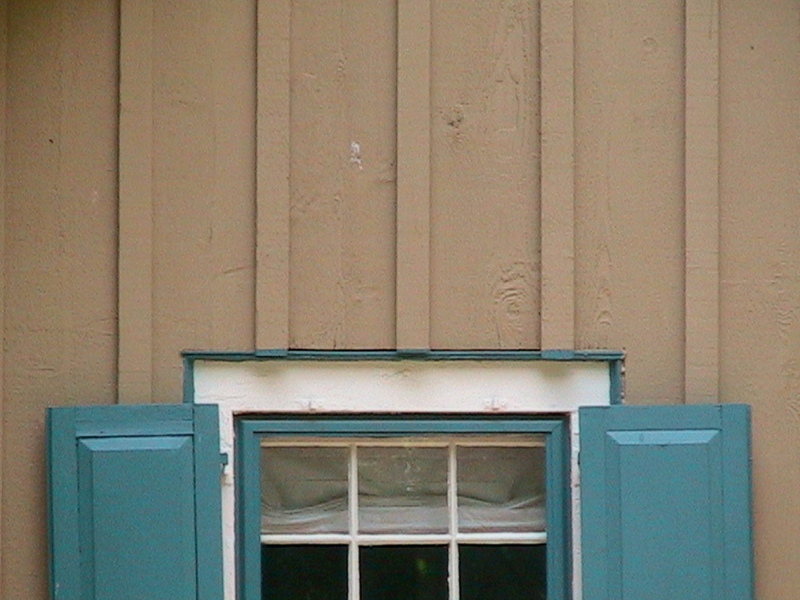 Rafter tails are the exposed ends of the parallel beams that support the roof. They are typically found on the eaves of Craftsman-style homes and porches. 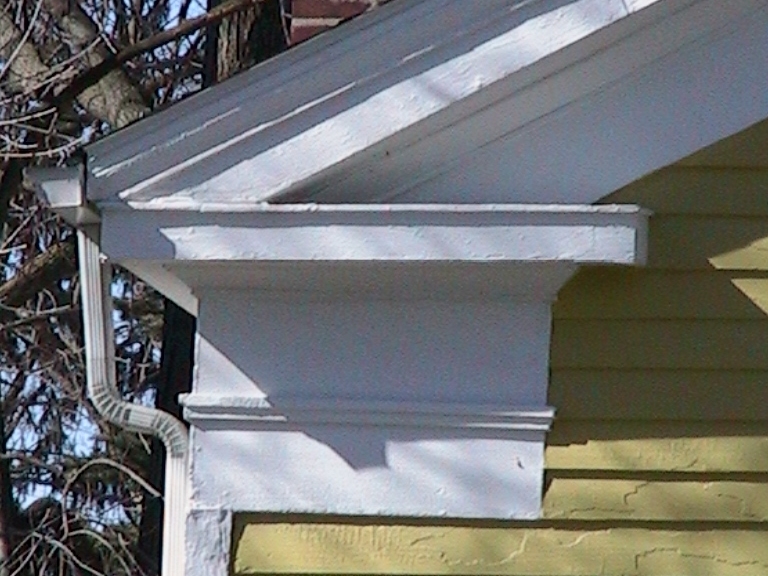 Verge boards, also called bargeboards or gingerbread trim, are often ornately carved or pierced boards that are fixed to the projecting edge of a gable roof. 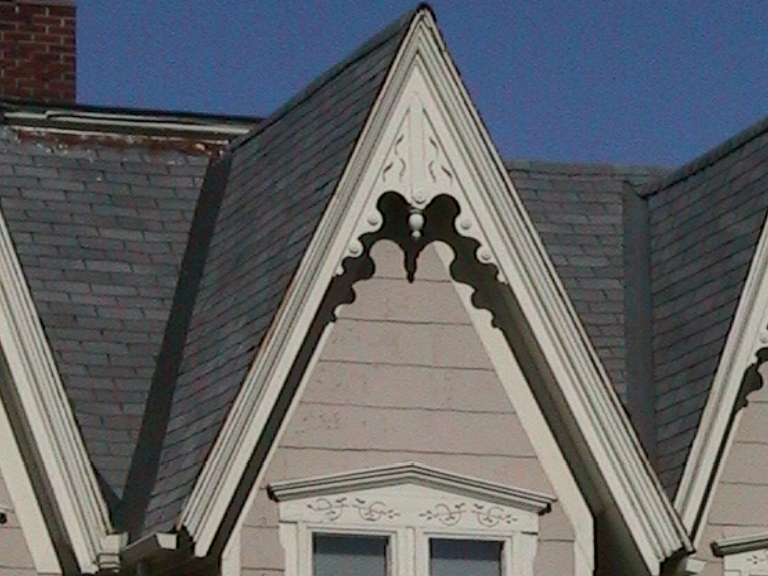 Decorative verge boards are one of the key features of Gothic Revival and Queen Anne homes. In classical architecture, the ornamental molding at the top of a wall, typically under the eaves, is divided into three parts: the architrave below, the frieze in the middle and the cornice above. 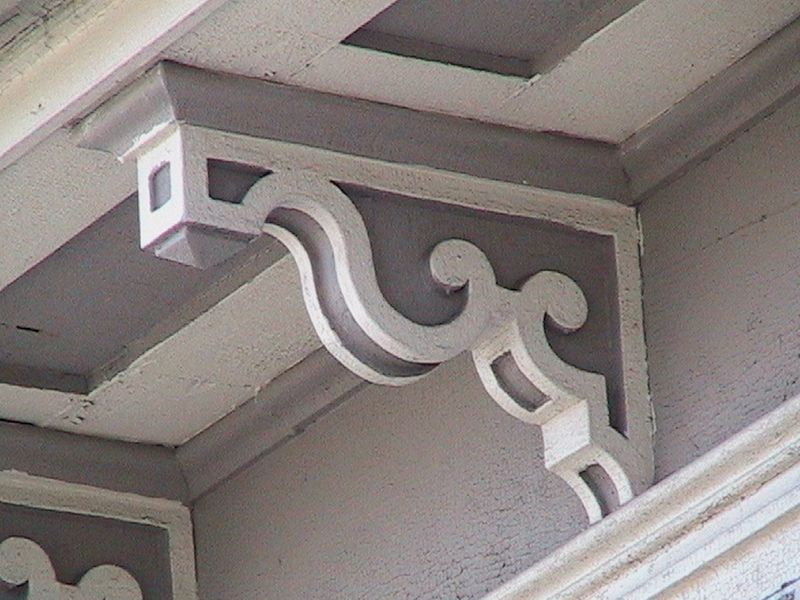 Informally, however, the term cornice is used to describe all three of these moldings. A frieze is a broad horizontal band along the top of wall. 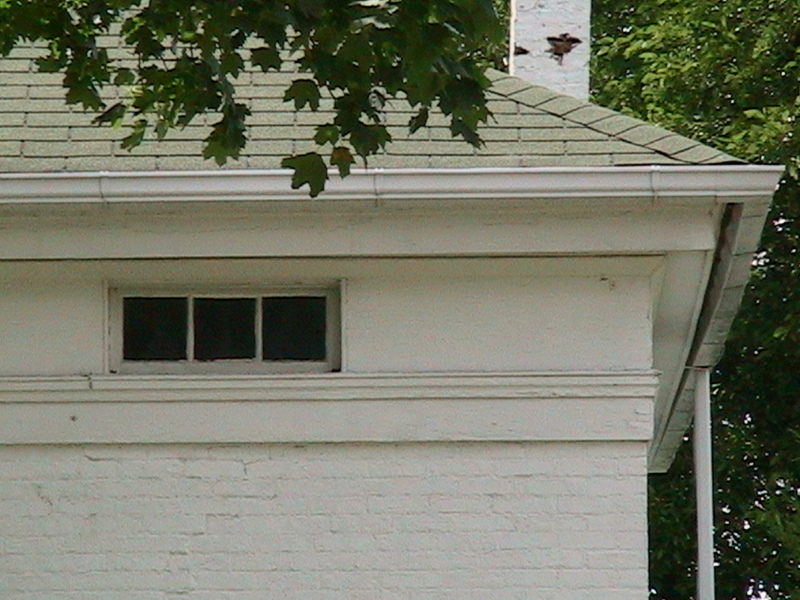 It is the key feature on a Greek Revival style building. On most ancient temples, the frieze would have been covered with sculptures. Most American friezes, however, are plain. 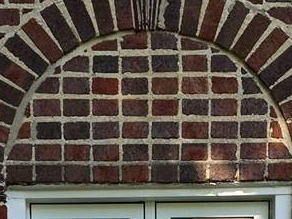 A corbel is an overlapping arrangement of bricks or stones in which each course extends farther out from the wall than the course below. Dentils are small blocks used in a series. Their name derives from the fact that they resemble teeth. Clapboard, pronounced “kla-berd,” also called beveled siding, is a weather-tight outer wall surface on wooden buildings. It is created by overlapping thin boards horizontally. Board and batten, associated with Gothic Revival architecture, is a type of siding consisting of wide boards set vertically. Joints between the boards are covered by narrow strips of wood called battens. Shingles are thin pieces of wood or other material laid in overlapping rows and used to cover the roof or wall of a house. They first became a popular wall treatment in the early 1880s. Machine-cut shingles were often arranged on Queen Anne buildings in a variety of ways, including hexagonal and fish-scale patterns. 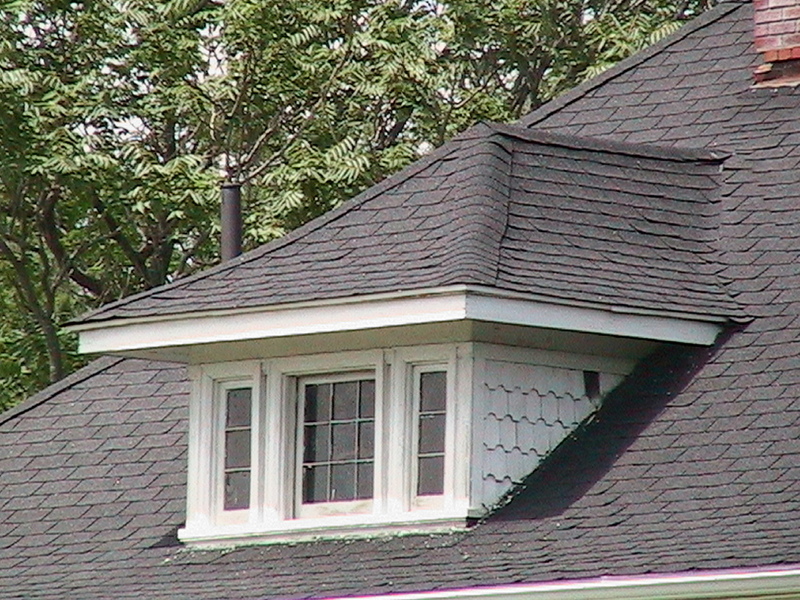 Rough-cut shingles are associated with Shingle Style and Colonial Revival architecture. A belt course (also called a string course or band course) is a continuous row or layer of stones, tile, brick, etc, that runs horizontally along the face of a building, like a belt in a pair of pants, to divide a wall into levels. Concrete block became popular after 1900, when Harmon Palmer patented the first cast-iron hollow block machine. His invention allowed two men to produce eighty to one hundred fire-resistant, low-maintenance, low-cost (compared to stone) blocks in a day. These concrete blocks were used both for foundations and for walls. Until the 1930s, the most popular face designs were rock face (shown here) and panel face. Half timbering is a construction or decoration method in which vertical, horizontal and diagonal timbers make up the frame of the wall. These timbers are then filled with lath and plaster (nogging), sticks and mud or clay (wattle and daub), stone, or brick. It is associated with the Queen Anne, Craftsman and Tudor styles. Greek Revival homes in Adrian are easily spotted by the small frieze windows set into the broad decorative frieze board that runs along the top of the exterior wall of the house. 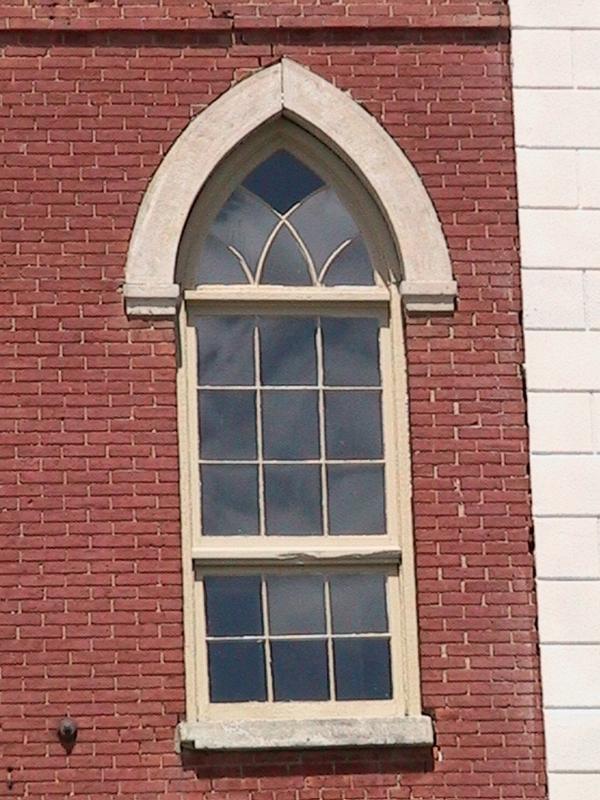 Windows and doors in non-residential Gothic Revival structures are occasionally set within pointed arches, which are sometimes referred to as lancets. They rarely appear in residential buildings in Adrian. Italianate windows are typically much taller and thinner proportionally than Greek Revival windows, resembling the shape of a door. 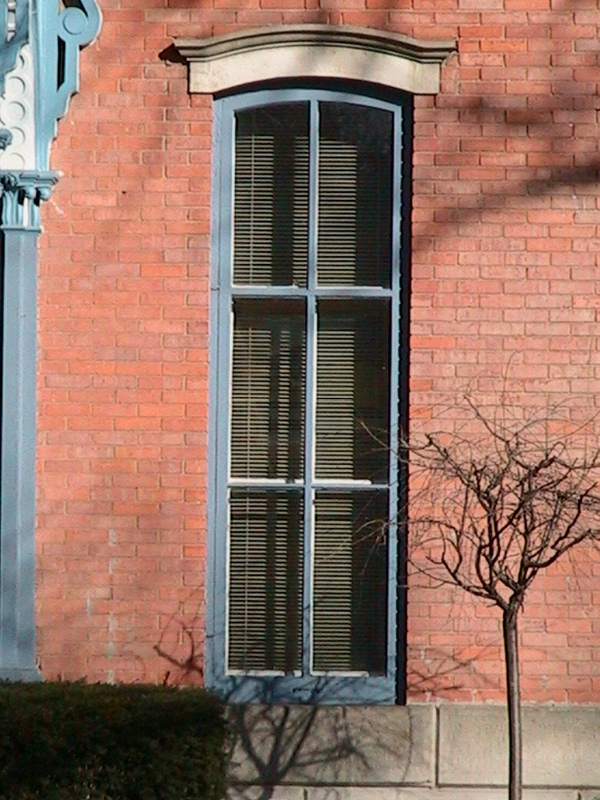 In fancier homes, these tall, thin windows are often crowned by half-round arched window heads that help to shed water away from the window opening. Queen Anne homes often feature windows with huge panes of glass, often bordered with small panes of leaded, etched or stained glass. Palladian windows, named after the 16th-century Renaissance architect Andrea Palladio, have a tall, central, arched window flanked on each side by shorter rectangular windows. Closely associated with the Classical Revival, they rarely appear on buildings in Adrian until after the 1893 Columbian Exposition. At the turn of the century, squat, half-round arch windows and doors began to appear on Romanesque Revival and Shingle-Style structures, such as the Bowen House, 320 Dennis Street, built in 1897. 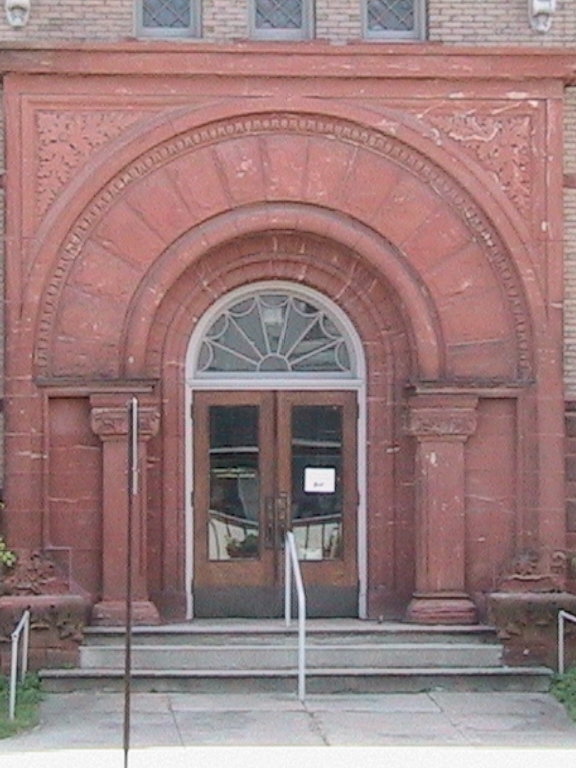 In the Richardsonian Romanesque style, one also finds transom windows arranged in ribbon-like patterns and rows of rounded windows framed with drip moulding. Colonial Revival homes typically feature double-hung windows that slide up and down and are divided into smaller panes of glass. A porch or portico is an entrance way usually with columns or posts and a roof that frames the front door of a house. Rectilinear transom windows above a door are more typical of a Greek Revival doorway. 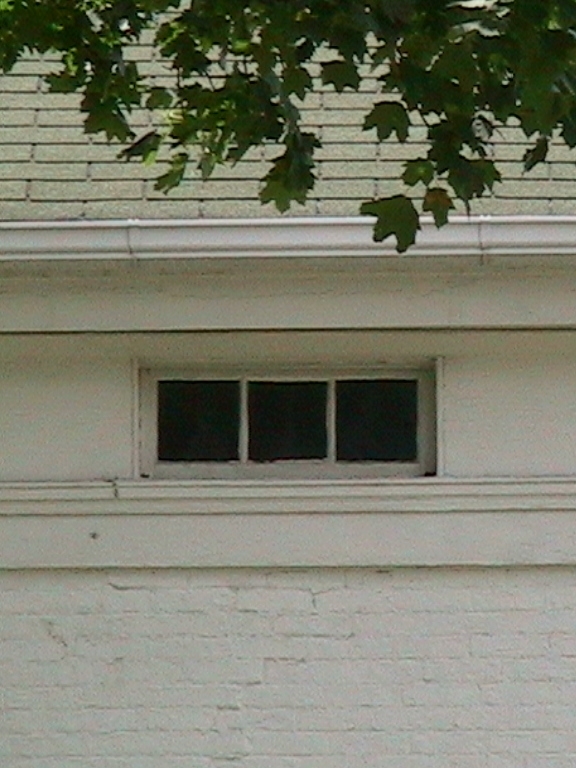 Colonial Revival buildings often have fanlights, which are semicircular or semi-elliptical transom windows—usually with glazing bars radiating out like a fan. Sidelights are stationary windows that flank a door. Queen Anne and Craftsman homes are more likely to have a room-size porch. A column is a supporting pillar consisting of a base, a cylindrical shaft, and a capital, which is the head or top of a column. Columns have played a prominent roll in a number of American architectural styles since the late eighteenth century. Most of the traditional column styles can be distinguished by their capitals. Colossal columns stand more than one story high. They are closely associated with Renaissance-revival and Classical Revival style architecture. The Corinthian order, named for the Greek city of Corinth, is the youngest of the three Greek architecture styles—and was the favorite of the ancient Romans. It features an elaborate capital that is decorated all the way around — traditionally with stylized representations of acanthus leaves. The Doric order is the oldest and plainest of the three Greek styles of architecture and is named for the region of Greece once inhabited by the Dorians. It features a plain, saucer-like capital and traditionally has no base. The Ionic order is named after the region of Greece inhabited by the Ionians in ancient times. It features a capital with turning elements called volutes that resemble rams’ horns. Romanesque columns do not follow a set order. Frequently, however, many feature cushion capitals that resemble large pillows. An engaged column is a decorative half column attached to a wall as decoration. When an engaged column is square in section, it is called a pilaster. Square columns are more properly called posts. Many Craftsman and Bungalow homes have tapered porch posts, wider at the bottom and narrower at the top. 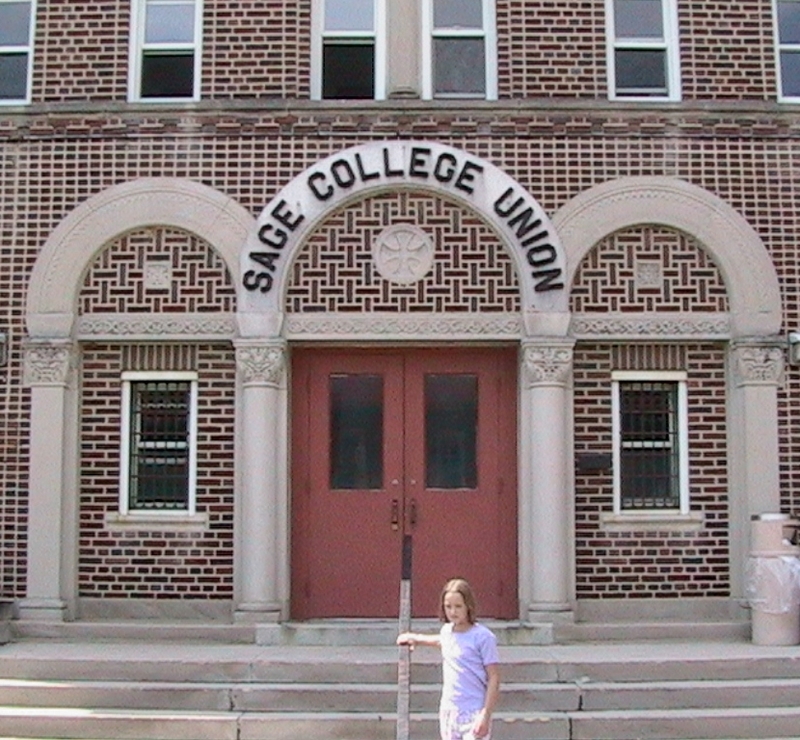 Others have earth-colored bricks or stones. The Tuscan order, named for the Tuscany region of Italy, is basically a simplified Doric order with an added base and plain, un-fluted, column shaft. Foundations can help date a building. Brick and stone foundations typically indicate that a home dates to before the twentieth century. A battered wall is a sloping wall, wider at the bottom than at the top. 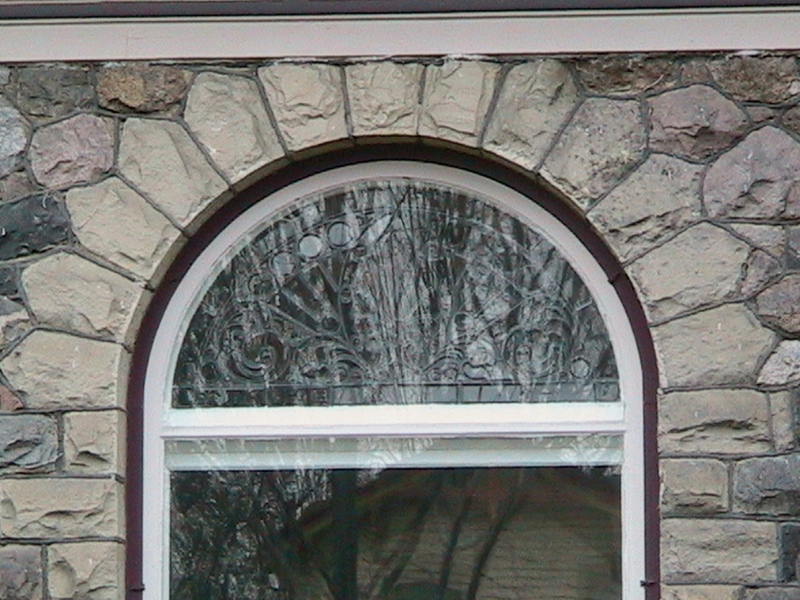 They are typically found on the foundations of Romanesque and Craftsman style structures.